The Kemiko process surpasses all others in terms of permanence and durability. It will not chip, fade, or peel, and will last the lifetime of the surface to which it is applied. 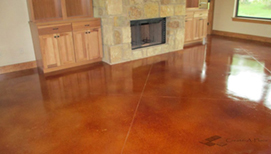 Those suffering from allergies find concrete staining especially appealing and a welcomed change. 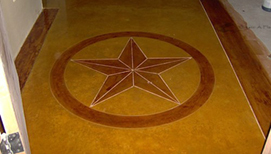 Acid Stain offers wide color variations, mottling and various depths of color within the slab. No exact preview of the final color(s) can be totally achieved. 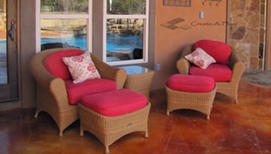 Unlike paint, Kemiko Stone Tone Stain reacts with the minerals present in the concrete. Each concrete slab accepts the stain in varying degrees of intensity. Installers will receive discount pricing on kemiko products. Should you have questions regarding the application of kemiko products, we encourage you to call Custom Concrete Solutions your local dealer and discuss them with us. Please contact us if your are interested in having your floors done professionally.